Imam Musa Ibn Ja‘far Al-Kazim (Arabic: موسى بن جعفر الكاظم‎), is known for his nickname Al-Kazim (the forbearing), Generosity was synonymous with his name and no beggar ever returned from his door empty handed. Even after his martyrdom, he continued to be obliging and was generous to his devotees who came to his holy tomb with prayers and behests which were invariably granted by God. Thus, one of his additional titles is also “Bab Al-Hawaij” (the door to fulfilling needs).he is the seventh Shia Imam after his father Imam Sadiq (PBUH). He is regarded by Sunnis as a renowned scholar and was contemporary with the Abbasid caliphs, Al-Mansur and Harun al-Rashid. He lived in very difficult times, in hiding, until he finally martyred in Baghdad in the prison through poisoning. Reza (PBUH), the eighth Imam, and Lady Fatimah Masumah (PBUH) were among his children. Imam Musa Kazim (PBUH) was born in 745 A.D (Zu al-Hijjah, 127 A.H) in Abva, between Mecca and Medina. He was born during the struggle between the Umayyad and the Abbasids, and had only four years when the first Abbasid Caliph came to the throne. His mother, Lady Hamidah, was originally a slave who was bought by his father, Imam Sadiq (PBUH), and was learnt and trained by him. With six brothers and nine sisters Imam Kazim (PBUH) grew up in a large family. He was chosen by Divine providence to succeed his father as the Imam. He passed twenty years of his sacred life under the gracious patronage of his holy father. His inherent genius and gifted virtues combined with the enlightened guidance and education from the Holy Imam Sadiq (PBUH), showed in the manifestation of his future personality. He was fully versed with the Divine Knowledge even in his childhood. Muhammad Baqir Majlisi relates that once Abu Hanifa happened to call upon the house of Imam Sadiq (PBUH) for some religious question. While he was waiting at the Imam’s door to get permission to enter, his son Musa Kazim who was then five years old came across him. When Abu Hanifa knew he was Imam sadiq’s son, asked him about the question he had prepared for Imam Sadiq (PBUH), he said: ” Boy, from whom does disobedience (issue)? Does it issue from Allah (God) or from the servant?” Kazim (PBUH) answered him: “Either it issues from Allah and not from the servant at all, so Allah does not punish the servant for what he does not do; or it issues from the servant and Allah, and Allah is a stronger partner. Therefore, the stronger partner has no right to punish the weak for a sin in which they are equal; or it issues form the servant and not from Allah. So If He wills to pardon (him), (He will pardon him), and If He wills to punish (him), (He will punish him); and Allah is He whose help is sought.” It said that, upon hearing this answer, Abu Hanifa got up to return home saying that the answer was good enough for him. 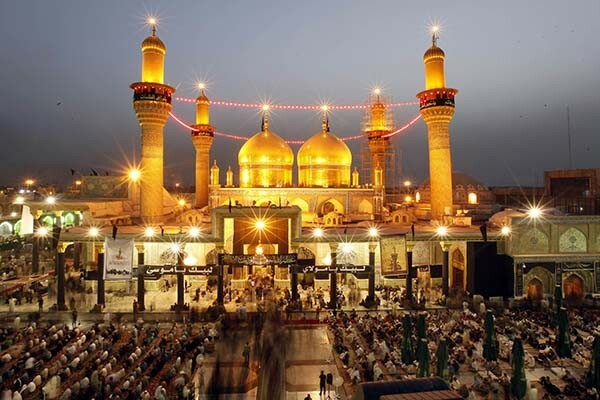 As regards his morality and ethical excellence, Ibn Hajar al-Haytami remarks: “The patience and forbearance of Imam Musa al-Kazim (PBUH) was such that, he was given the title of ‘al-Kazim’ (one who swallows down his anger). He was the embodiment of virtue and generosity. He devoted his nights to the prayers of Allah and his days to fasting. He always forgave those who did wrong to him.” His kind and generous attitude towards the people was such that he used to patronize and help the poor and destitute people of Medina and provide for them cash, food, clothes and other necessitates of sustenance secretly. It continued to be a riddle for the receivers of gifts throughout the Imam’s lifetime as to whom their benefactor was, but the secret was not revealed until after his martyrdom. The history of the Shia Imams generally demonstrates their constant struggle against oppression, which sometimes included practicing Taqiya (it is acceptable to hide one’s true opinions if by revealing them, one put oneself or others in danger). Imam Musa Kazim (PBUH) lived under the most crucial times in the regimes of the despotic ‘Abbasid kings who were marked for their tyrannical and cruel administration. As for Imam Kazim, when his father, the sixth Imam, was poisoned, Mansur further wanted to put an end to the whole question of imamate so he wrote to the governor of Medina commanding him to go to the house of the deceased Imam on the pretext of expressing condolences to the family, and to ask for the Imam’s testament and read it. Whoever was chosen by the Imam as his successor should be beheaded. Reading the testament, however, the governor of Medina saw that the Imam had chosen four people rather than one: the caliph himself, the governor of Medina, Abdullah al-Aftah (the Imam’s older son), and Musa Kazim, his younger son. Accordingly the plot of Mansur failed. Nevertheless, unlike his father who lived in a favorable climate in which he was able to teach openly in Medina, Imam Musa Kazim (PBUH) lived with severe restriction placed upon him by such Abbasid caliphs as al-Mansur and Harun al-Rashid. The period of his Imamate continued for thirty-five years. After the martyrdom of Imam Sadiq (PBUH), the sixth Imam, the majority of Shia followed his son Imam Musa Kazim (PBUH) while another group, followed Isma’il, the older son of Imam Sadiq (PBUH), who had died while his father was still alive. This latter group separated afterwards from the majority of Shia and became known as Ismailis. Others accepted as Imam either Abdullah al-Aftah or Muhammad, both sons of the Imam Sadiq (PBUH). Finally, another party stopped with the sixth Imam himself and considered him as the last Imam. Most life of Imam Kazim passed in prisons by the Abbasid caliph. First imprisonment was when the Caliph of the time, Harun al-Rashid had him arrested and brought to Baghdad. He prisoned Imam Kazim to kill him easier, but whenever he decided to do it, something happened and he couldn’t complete his plan. Then he freed Imam Kazim but Imam was under supervision. The second Imprisonment occurred when the Imam was also repeatedly subject to suspicion and disfavor. 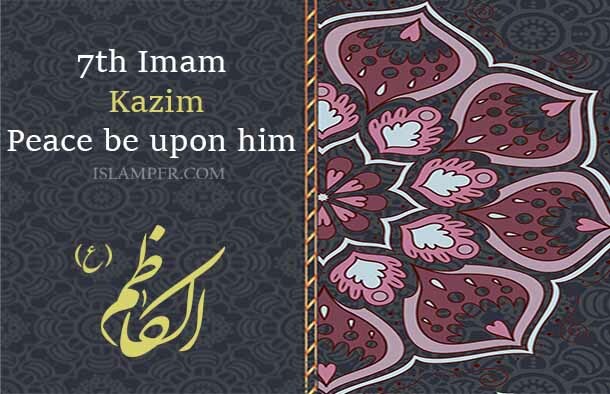 Imam Kazim was kept in a dungeon without any light, loss of food and water and everyday he was under torture, however, he was always praying and praising God. Imam Kazim was arrested and then freed several times. Since The fire of malice and jealousy against the Ahl Al-Bayt (the progeny of the prophet Muhammad (PBUH)) was kindled in the heart of Harun al-Rashid, when he saw the great influence and popularity which the Holy Imam had amongst the people there, He got the Imam arrested while he was busy in prayer at the mosque of the Holy Prophet and kept him in prison in Baghdad for a period of about four years. Finally, in 799 (25, Rajab ,183 AH), he got the Imam martyred by poison. Al-Fakhri adds; Al-Rashid was at Rakka when he sent orders that the Imam should be put to death. They then brought a number of reputable men to Karkh to act as coroners and to testify publicly that he had died a natural death. He, then, was buried in the cemetery of Quraish on the south side of Baghdad. The place he was buried was a cemetery, but soon this place became the focus of pilgrimage on the grave of the Imam. A town grew around the grave yard. The name of the town became Kazimiya, (the town of the Imam Kazim (PBUH)) A reputed school of theology was founded in this town which is still a source of learning for many students from all over the world. After the martyrdom of Imam Musa Kazim (PBUH), Shia Muslims followed his son and his successor, Imam Reza (PBUH), while some stopped with the seventh Imam and became known as the Waqifiyah. Just real Shia Muslims also consider from the eighth Imam to the twelfth Imam, who is the last one and the promised, Mahdi (PBUH). “He is free” she replied. The slave girl came into the house while Bishir was at the wine table, so he asked her: “What delayed you?” She gave him an account of what took place between her and the Imam. It is said that Bishr quickly jumped to his feet and headed to the door barefooted but the pious man had already left. He left in pursuit of the man and when he finally caught up with him asked him to repeat his words and he obliged. Bishr was so taken aback by his words that he fell to the ground and began to cry. “No I am a slave, I am a slave.” From then onwards he would walk without shoes and people began calling him Bishr al-Haafi (The bare footed one). When he was asked why he did not wear shoes, he would reply “My master Allah guided me when I was barefooted and I will remain in this condition till death”.